Kennebunkport is a madhouse, perhaps the epitome of tourist Maine. The sidewalks are jammed with people, the cars creep along the crowded streets, and the waterfront is more boat than river. The fact that it is the location of George H. W. Bush’s summer compound adds to the fervor. Nevertheless, Kennebunkport has appeal for visiting yachtsmen, with places to explore and tranquil oases here and there. There are few, if any, moorings available for transients, and anchoring is not allowed. But if you can find—or afford—a place to tie up, this is a snug and extremely well-protected harbor. The river is prone to silting, but periodically it is dredged. Currently a 6-foot draft is about the most you can carry into this harbor at low water. The Kennebunk River was probably discovered by Bartholomew Gosnold in 1602 or Martin Pring in 1603. In its natural state, it was a barred harbor with only two feet of water at the entrance at low tide and navigable for only about half a mile. Kennebunk and nearby towns were settled in 1643 but depopulated several times during the Indian Wars. During the nineteenth century, the banks of the Kennebunk River boasted six shipyards that launched 638 vessels. Entering the Kennebunk River is easy. From the lighted green entrance bell “1,” keep Fishing Rock and its can “3” to port. If you like to cut corners and are approaching from the south, you can stay close inshore and leave Fishing Rock to starboard, passing between its daybeacon “F” and daybeacon “O” to port, but don’t cut either too close. Keep well off the rock between daybeacon “3” and can “5” near the mouth of the jetties. Drop your sails outside and proceed between the jetties. Do not enter if heavy swells are running into the river. In 1995, the trough of a wave landed a fishing boat hard on the bottom of the river and it sank. The river’s channel is periodically dredged to a controlling depth of about 8 feet at the entrance and 6 feet farther upriver, but expect continued silting. Moored boats can sometimes obscure the channel buoys, so it is wise to keep track of them as you go. Current is a modest 2 or 3 knots except upriver where it begins to be squeezed before passing beneath the bridge. Don’t wait until it is too late to make your U-turn; you might discover the hard way that the bridge’s 5-foot vertical clearance is somewhat less than the height of your mast and that what is shown as a swing bridge on the charts is welded shut. Anchoring is not permitted in the river. MMost moorings on the river are private, with a long list of residents waiting for them, but the town maintains two for transients with a maximum stay of two nights. Call the harbormaster for reservations. Because space is at a premium, transient slip space should be reserved in advance. 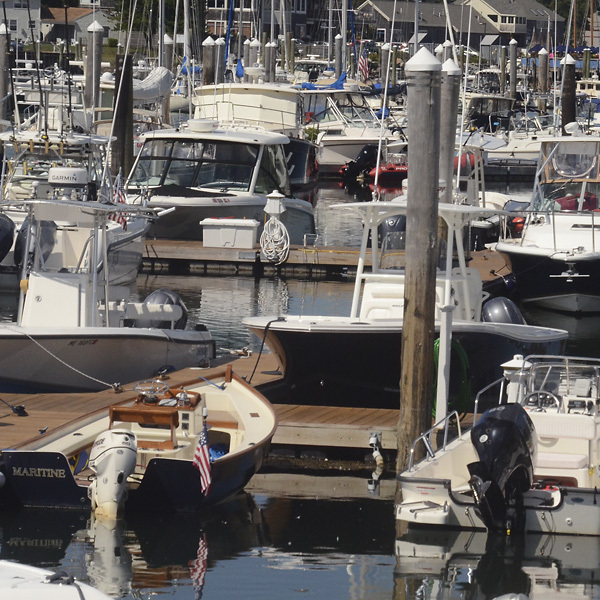 Most of the yacht facilities lie on the east bank of the river in Kennebunkport. They are listed in order heading up river. Harbormaster Ray Billings (Ch. 09; 207-205-0991). In addition to the two town moorings, a floating spump-out barge is moored off the Arundel Yacht Club. The Nonantum Hotel and Marina (207-967-4050; nonantumresort.com). This informal marina is primarily for guests of the hotel, but occasionally there is space available for transients. The docks have 6 feet alongside but no other facilities. Chick’s Marina (Ch. 09, 68; 207-967-2782; chicksmarina.com). Chick’s is the largest marina on the river. The docks have 6 feet of water at low, and they can accommodate boats of well over a hundred feet if you should be so lucky. They pump gas and diesel and have water, electricity, pump-outs, showers, laundry facilities, Wi-Fi, and a marine store. Chick’s hauls boats by hydraulic trailer but has no service department. They operate an electric vehicle to run you to the shops and restaurants in town. Kennebunkport Marina (Ch. 09, 16; 207-967-3411; kennebunkportmarina.com). The docks here are rented seasonally, but transients are welcome if dock space is available. The docks have 7 feet of depth, water, electricity, but no fuel. Showers and ice are available, along with a sailors’ lounge. A ship’s store and mechanic are ashore. Yachtsman Lodge and Marina (Ch. 09; 207-967-2511; yachtsmanlodge.com). This upscale marina welcomes transient boaters when they have space available. They can berth boats to 100 feet and provide water, 100-amp electricity, showers, ice, and even a gas grill and outside tables overlooking the docks. You’re in good company here—this is where George H. W. Bush keeps his Cigarette boat and where the Secret Service keep theirs. Arundel Yacht Club (Ch. 09; 207-967-3060; arundelyachtclub.org). The clubhouse is a wonderful wooden building that was once part of a rope walk where rope was laid and twisted. A limited number of rental slips are available here, with up to 5 feet of depth, water, and electricity. Ice and club showers are ashore. DiMillo’s Kennebunk (207-318-0623; dimillosmarina.com) slips are on the west side of the river, just beyond the yacht club and opposite Arundel Wharf. They have slips for transients to 80 feet, with depths of 8 feet at low. Water and power are on the docks and showers and restrooms are planned. The Kennebunk River separates two towns. The Lower Village of Kennebunk is to the west of the bridge, and Kennebunkport is to the east. The bridge is known locally as the Taintown bridge because the town on the far side, to Kennebunkporters, ‘tain’t Kennebunkport—it’s Taintown. H.B. Provisions (967-5762), located just beyond the bridge in the Lower Village, carries limited groceries, fresh baked goods, a full deli, and wine. Take a right at the next intersection to find Port Hardware, a laundromat (967-5066), and farther out of town, Market Day (967-5577), a natural foods store and gourmet deli. A small playground is next door to the laundromat, so your kids and clothes can tumble at the same time. The landmark Clam Shack takeout and fish market is hard by the bridge. The Pilot House (967-9961), nearly next door, is a favorite hangout of local watermen. The Schooner Spirit of Massachusetts is docked steps away. She’s now a restaurant with a huge wraparound bar on the main deck under a white canopy. They do not take reservatons. Around the corner, among the Shipyard Shops, is Federal Jack’s Brew Pub (967-4322), the original home of Shipyard Brewing Company. Take the right on Route 35 to find funky Pedro’s Mexican (967-5544) and Mekhong Thai(967-8827) tucked behind them. Busy Dock Square lies on the eastern, Kennebunkport side of the bridge. You will find stores, ice cream shops, and numerous restaurants within walking distance. Notable among them are The Hurricane (967-9111), One Dock Prime Steakhouse (967-2621) in the Kennebunkport Inn, and David’s (967-8225) at the water’s edge in the smallBoathouse hotel. If you are docked closer to the mouth of the river, your dining spectrum is covered by Port Lobster Co. for excellent eat-in-the-rough lobster and clams to Ocean (967-4015) at the Cape Arundel Inn. To appreciate the town’s splendid architecture, start at the river and walk two blocks east to Maine Street, then along quiet, shaded streets lined with colonial and federal homes. Follow the street north along Grist Mill Pond. White Columns, built in 1853, was donated to the historical society in 1983 along with its completely original furnishings and decor, and it is now open to the public. As you walk, notice the trees. The large collection of mature American elms casts its shade on the town of Kennebunkport, saved from Dutch Elm disease by the foresight of the town’s tree warden in the early 1960s and through constant municipal and volunteer efforts. For another walk, in the most peaceful part of town, land at the Nonantum Hotel and walk south along Parson’s Way to the oceanfront. En route is “The Floats,” used by novelist Booth Tarkington as a boathouse and summer afternoon retreat. The classic shingle-style boathouse of the Kennebunk River Club was built just to the south in 1889 to house canoes and social functions. It is still a private club. At high tide you can land your dinghy on the west bank of the river near a brown, wooden gazebo. A boardwalk and path lead through trees and gardens to the chapel of St. Anthony Monastery (844-581-0945), the home of Lithuanian Franciscan monks. The handsome grounds and some areas of the monastery are open to the public. Or, if it is sunny, land at the little sand beach on the west bank out past can “7” and walk over to the sandy expanse of Gooch’s Beach. Another marvelous exploration by dinghy is up the Kennebunkport marshes. At midtide, head under the Taintown Bridge and into the basin. Keep following the stream to the right, wending through the tranquil marsh grasses. Bring your binoculars for birdwatching. Shipyards on these banks once built ships up to 200 feet long, and the remains of the locks needed to hold the water back for their launchings can still be seen. If your curiosity takes you as far as the first highway bridge, stroll up the hill on the east bank to visit the Landing School of Boatbuilding and Design (985-7976, landingschool.edu). If you still can’t get enough of the water, the Kennebunk River claims to have more tour, sightseeing, whale-watching, deep-sea fishing, and ex-president-peeping boats than anywhere else on the coast.